Information for where the campsites are located in the Granada area of Spain. The city is characterised by it scenic diversity, architectural beauty and a rich and distinguished history that exudes from the city. If you are staying in or visiting the Granada be prepared to fall in love with the city. No one leaves unaffected by the magnificence of the Alhambra Palace, the backdrop of the Sierra Nevada mountain range, or bohemian atmosphere. Featuring an outdoor pool and children’s play area, Camping Ruta del Purche is set by Sierra Nevada National Park and a 20-minute drive from central Granada. Campsite near Granada for The Alhambra and Skiing. 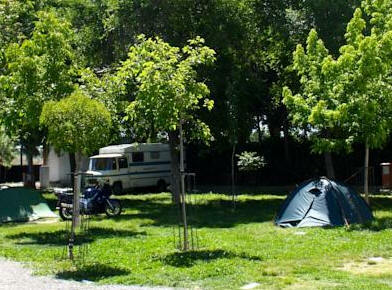 Camping Las Lomas in Güejar Sierra is about 20 minutes from Granada city. A beautifully located site with views of the snowy-peaks of the Sierra Nevada Mountains and the Reservoir Pantano de Canales on the Rio Genil. The reservoir fed by the meltwater from the Sierras is clear and the views almost alpine. 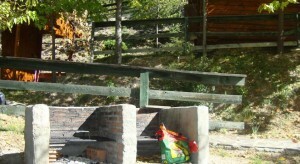 Guejar Sierra complex offers wooden, chalet-style bungalows, each with its own garden area and private porch. 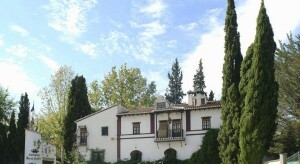 Granada’s climate is friendly and dry, the air clean and healthy, with clear and cheerful skies. Strong winds, fog and snow are rare. The Granada region offers Spain’s richest variety of climate and landscape, from the alpine vegetation of the Sierra Nevada to the tropical coast of Motril, where winter temperatures average 15 C while some villages in the Sierra experience minus 10 C.
Perhaps no other region on the peninsula has such contrasting and manifold variety, unfolding at the foot of snow-topped mountains with the best skiing slopes and rich fertile plains, such as those mentioned for Granada and Motril, and those of Loja, Guadix and Baza. Granada is the archetypal southern Spanish town — a place not to be missed. This first afternoon we will visit two of the most impressive edifices ever built — the hilltop fortress of The Alcazaba, and the gigantic palace complex of the Alhambra, which was the last refuge of the Moors in Spain. The Alhambra embraces hundreds of years of architectural history that includes private dwellings still occupied today. It also includes several churches, a restaurant, gardens, statues and fountains, and the centerpiece 16th-century Renaissance palace. All this overwhelming opulence makes an unforgettable impression, among a honeycomb of palatial interiors, covered passageways, obscure alleys, and several dozen elegant courtyards scattered throughout the Casa Real. This is one of Europes top sights! 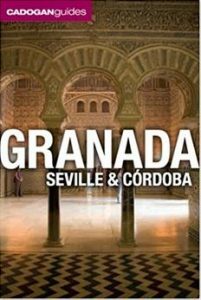 Cadogan’s expert authors explore Granada, Seville and Cordoba, the three great cities of al-Andalus. Discover the unique monuments, vibrant culture and secret gardens of delight bequeathed by the brilliant golden age of an extraordinary civilization. Gaze in wonder at Granada’s Alhambra and the Mezquita in C rdoba; explore the whitewashed warrens and hidden patios at the heart of each city; and escape to wild sierras or Mediterranean beaches. Granada area of Spain Campsites.